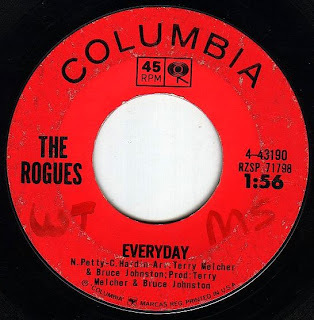 Let's not confuse this studio group with the other 100 or so "Rogues" out there. This is Bruce Johnston & Terry Melcher doing a super solid remake of Buddy Holly's lightweight classic. Sorry Buddy Holly fans, but this version is absolutely the best I've ever heard, with a nice "Louie Louie" thing thrown in for good measure! Here's a nice early '60s rocker. The only thing I could find out about C.L. Weldon is that he released an album of hard blues rock called "Houston's Natural Gass" with another guy named Jesse Lankford. It sounds an awful lot like Grand Funk Railroad. Hey, let's throw in some nice "folk rock" OK? This was Mama Cass and Denny Doherty of Mamas and Papas fame with Zal Yanovsky of Lovin' Spoonful fame before they split into their respective groups. I'm not a "folkie", in the trditional sense, but I kinda like this "power folk" (for lack of a better term). As long as we're doing the "meaningful folk rock" thing, let's throw in this little nugget. 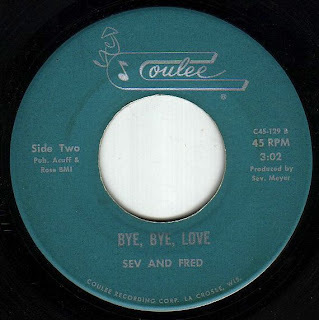 We Five's "You Were On My Mind" was one of the first to blend traditional folk with rock music. I think it's a fantastic song. 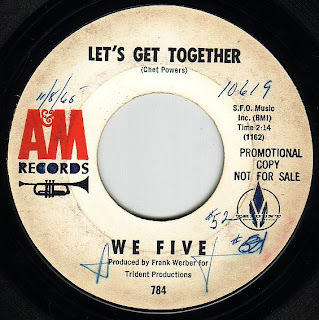 What is overlooked is the fact that We Five did the hippie anthem "Let's Get Together" a good two years before the Youngbloods had a hit with it. This one's a completely different take on the song. Real cool. 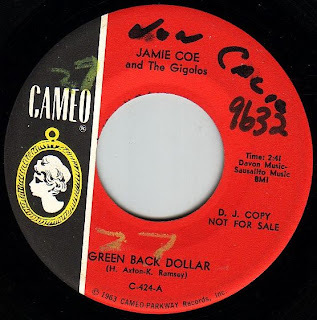 Jamie Coe was discovered by Bobby Darrin in the late fifties and did a few teen rocker 45s. 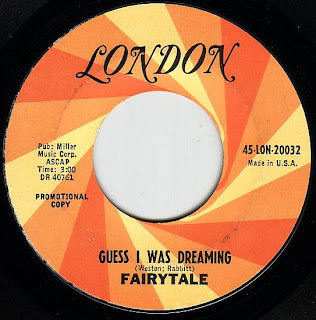 After the Beatles hit big he lost his popularity (except in Michigan where he was still a big favorite), changed his up sound and released this cool folk rock 45. A Washington DC. 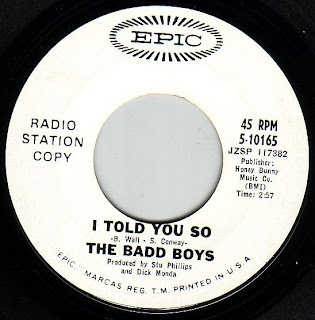 group that had a few 45's released, all of them pretty good. This one is rumored to be the Chartbusters in disguise. It's real hard to believe that this is the same band that gave us Louie Louie, or even Jolly Green Giant for that matter. 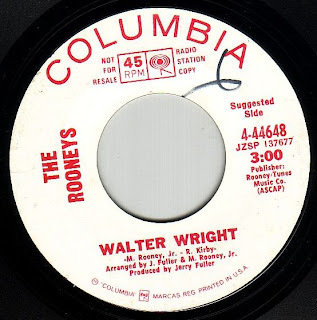 Nonetheless, this is a terrific version of George Harrison's classic folk rocker. Here's one of those borderline tunes with horns. This one's pretty good though, because it's got cool fuzz guitars, and the singer sounds just like Joey Ramone! From the Maryland / D.C. area. I don't think this band needs any introduction. 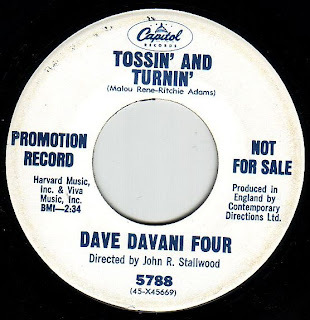 This was one of their better efforts that wasn't a clone of "Pushin' Too Hard"
The first "garage" 45 I ever bought! A true classic! 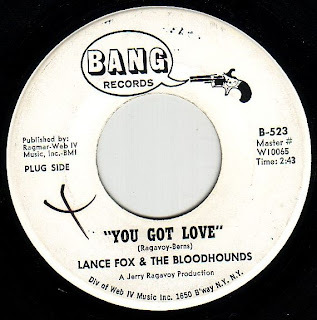 The flip side "Hurtin' For Your Love" is really overlooked. Great folky/poppy/psyche sounds from a group out of Castro Valley, a suburb of San Fransisco. I originally bought this for the freaky instrumental psychedelic flip side "Road Runner", while completely ignoring the A side. Well...you know what? The A side is pretty freaking cool. Emphasis on "freak". 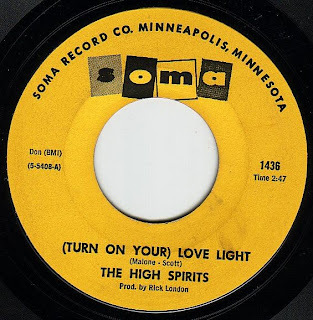 The guys who sang the bubblegum classic "Little Bit Of Soul" really take a left turn on this 45. Here's another Kasenetz & Katz effort, this time by the Yummy Yummy Yummy guys. 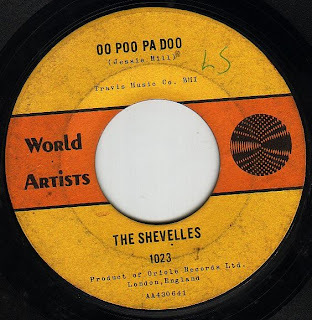 Between that and the great "Beg Borrow and Steal", this group tried their hand at the Standells' hit. 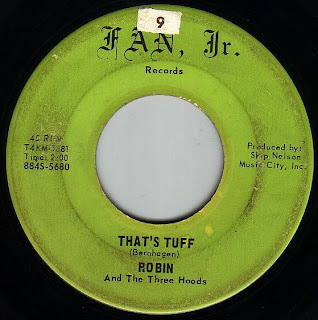 The flip was co-written by Tony Orlando! 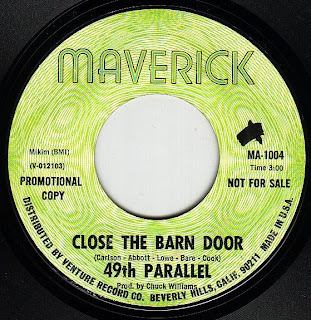 Debut 45 by one of the best known Texas psyche bands ever. It was there, so I had to include it. Definitely not a garage tune, but a great rockin' blues number. 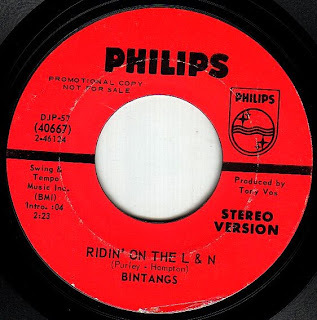 The Bintangs from The Netherlands have been around forever and are a very prolific group. YOW! It's been almost one full year to this day that I started this blog thing, and I'm really enjoying the hell out of it. I'm planning on some "special editions" in the near future like an all instrumental edition, and one or two (maybe three) that will focus on upstate New York groups. The comments section is really taking off too. 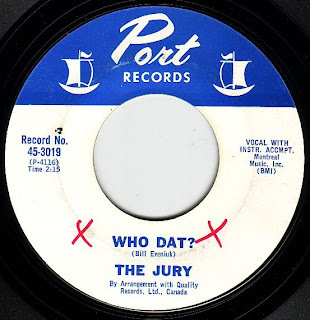 Thanks again to all who made corrections and provided valuable information on some very unknown bands. Here's a reminder...check out all the other cool blogs I have listed in my favorites. 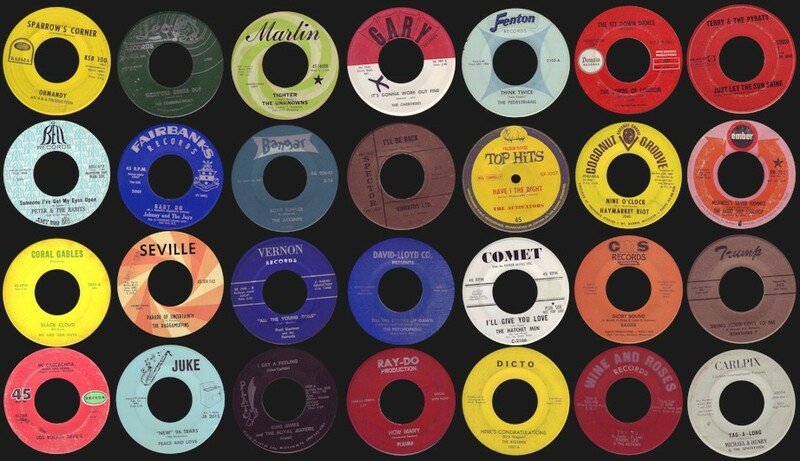 They're all great and provide a wealth of info as well as some fantastic tunes. Here's a group that I tried really hard (well...at least as hard as I can try) to find some info on, but reached a dead end. Possibly from Canada(? 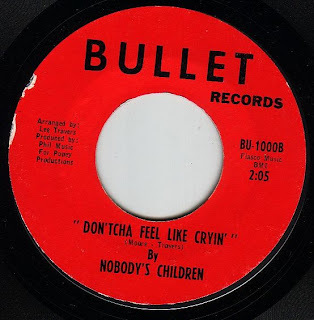 ), Ottawa's Don Norman & The Other Four covered "The Bounce" in '66. Top side is a rather inept invasion styled tune. Relatively crude stuff for a major label. Real spooky, moody garage with LOTS of reverb in the mix. 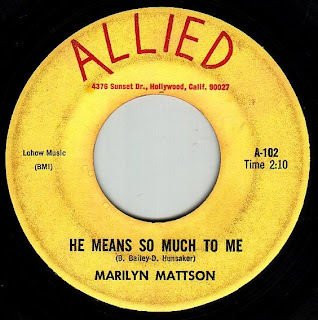 Not exactly sure who Marilyn was, but she managed to put out this one 45. She also graces the cover of our post. This Wisconsin group released this three times. 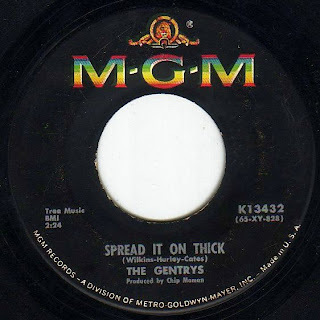 Twice on this label with different flip sides, and once on Hollywood Records which was distributed nationally. 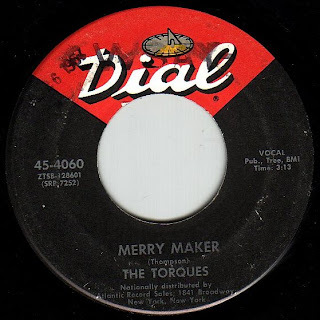 This is a fantastic garage two sider with great guitar breaks on both. 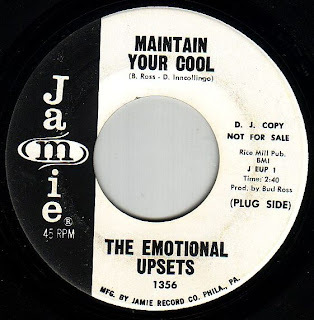 Superb Mod/R&B sounds ala Georgie Fame and Zoot Money. 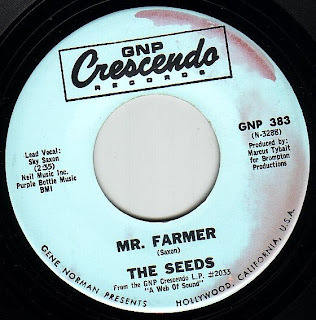 Way cool Hammond organ throughout. Tough garage from Rockville, MD, with raunchy guitars and a driving organ. The flips' a great pop/psyche number. Grade 'A' garage classic! 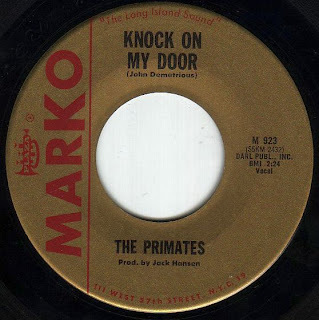 These guys were from Astoria in Queens and had another great 45 "Don't Press Your Luck", which is rarer, but this is hands down the better record. 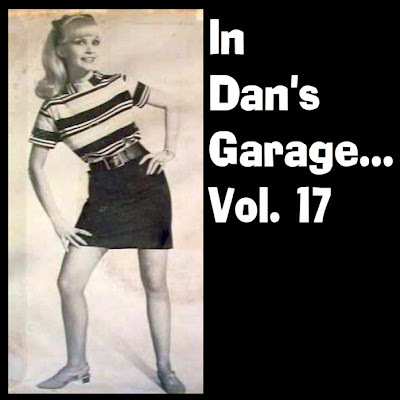 Real lo-fi garage at its best! Here's a good example of a garage band forgoing the usual guitar solo in favor of a sax. It works, cause this song is great with sort of a meanacing tone to it. 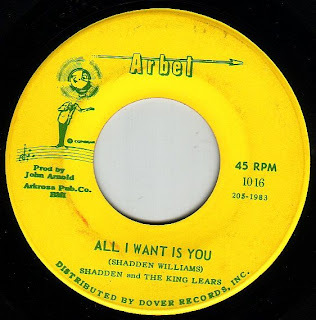 Shadden & The King Lears were a very popular group from Memphis, and the flip of this one is "Come Back When You Grow Up Girl" made famous by super wimp Bobby Vee. Ironically, this one came out first. Another mystery group. Terrific reverb soaked guitar and electric piano instead of the typical cheesy organ. Stinging punk with the snottiest vocals from Winnipeg, Manitoba, Canada. I don't know a lot about these guys either, but any info would be appreciated. This is another bona-fide classic. 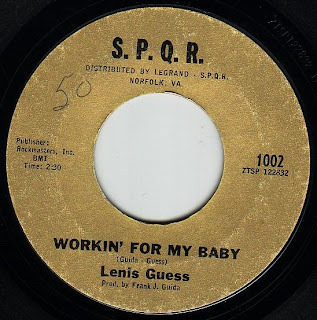 Lenis Guess is a very popular R&B/Soul singer from Norfolk, VA. 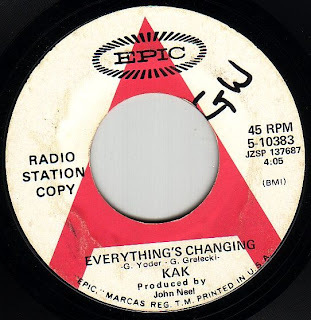 Although most of his output is straight up soul, he fronts a way cool garage band on this one, and the result is this top notch winner, with a heavy dose of garage attitude. Great punk from Houston,Tx. 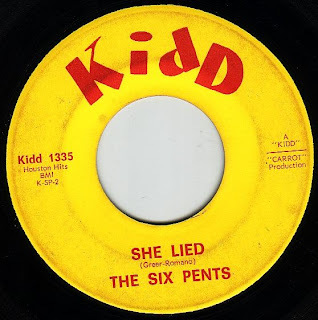 These guys changed their name to the Sixpentz, had an album and a couple of 45 on Mainstream records, and eventually became "Fun & Games", a more pop oriented group. I really don't dig "horn bands", or any horns. I say that as a plural. A wild honkin' sax player is totally cool, and yes, horns ections are essential in soul and r&b music. But you get what I'm saying right? I do have to make exceptions though, and this is one. This 45 is just freakin' wild! 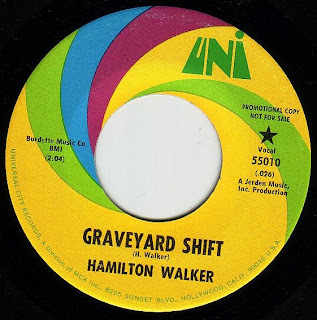 Hamilton Walker was obviously from the Pacific NW, as this is a Jerden Records production. 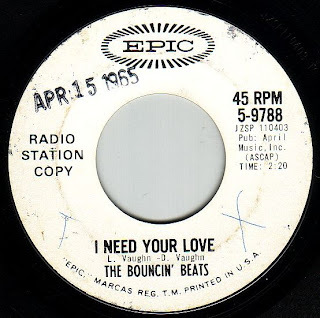 You can tell by the pounding drums, especially on "You Must Be The One". I still can't figure out the weird swishing noise on that tune. I first thought my record was screwed up, but it's actually right in the mix! 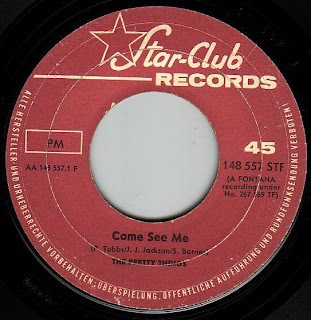 Pretty Things - Come See Me / L.S.D. Another mystery group. 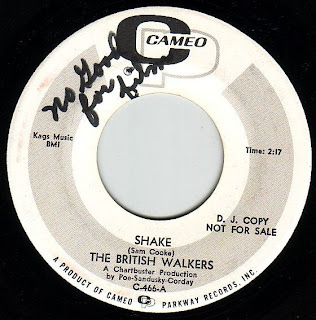 The top side is a great pop/psyche tune, and the flip is a good rendition of the Zombies classic. Greetings friends and followers! I'd like to thank all of you who left comments on my last, and all previous posts. I'm very flattered, and I hope you're enjoying them. Extra special thanks go out to the people who've left valuable information about some of these bands, and hey, if any of you were actually in any of these groups, we'd love to hear from you! Alrighty then, let get this show on the road! 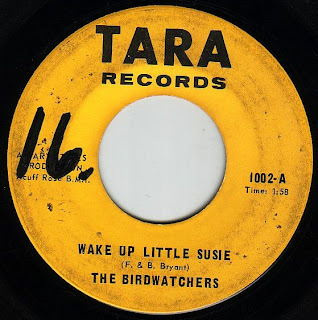 The Birdwatchers were a rather prolific group from Tampa, FL who released about 21 different 45s in various styles. 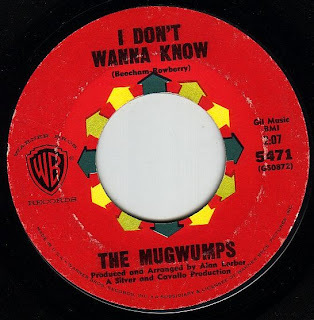 "I'm Gonna Love You Anyway" is perhaps their most famous. 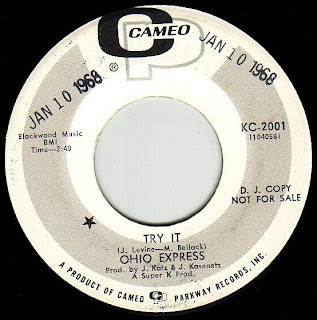 This early one is real garagey and is kind of tough to find. 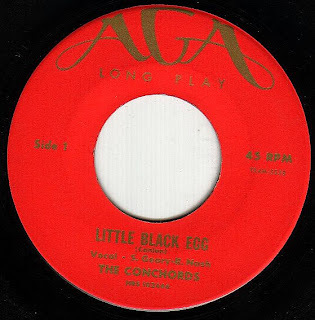 Here's another mystery group doing a nice version of Little Black Egg. 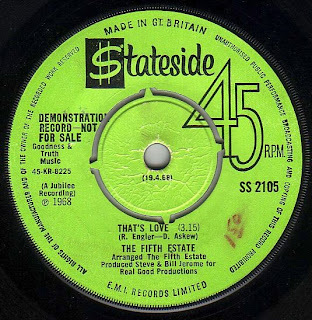 The flip's a cover of The Tornadoes "Telstar" which I'm saving for a special "Instrumental Edition"
Totally whacked out version of this standard which has been covered by everyone from Guy Mitchell, to Marty Robbins, to Marie Osmond. 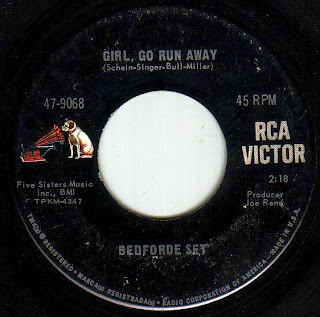 This is a prime example, actually it's probably THE BEST example, of how crazy Joe Meek could get in the studio. Where he got the idea for that absolutely crazed guitar riff is beyond me. Sheer genius. 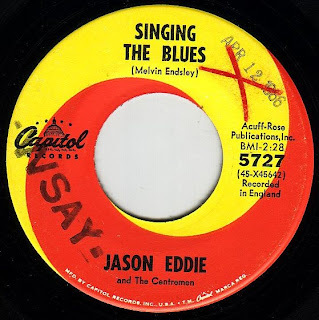 Jason Eddie was actually Billy Fury's brother, and continues to perform to this day, doing a tribute to him. 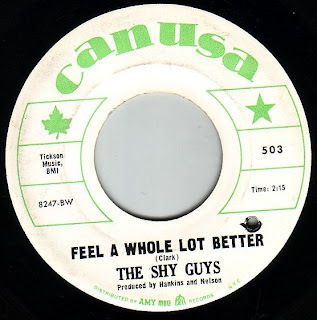 Another real obscure group from The Bronx. 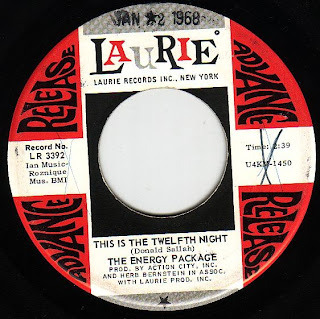 Real teen garage stuff here with some rather off key vocal harmonies. 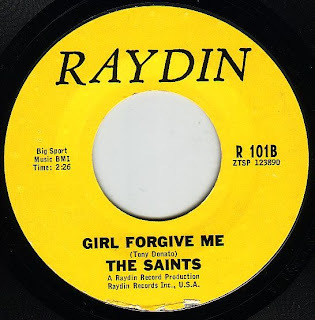 Real good version by a Detroit area band, with a vocal harmony thing in lieu of a guitar break. The flip is a cool up tempo garage number. 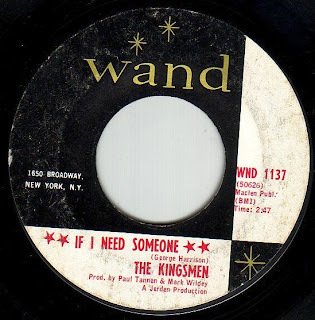 Here's an interesting 45 by another unknown group. 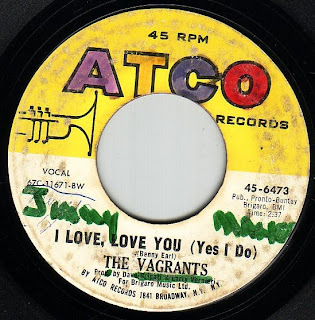 Famed songwriter/producer, Jerry Ragavoy has his name all over this record, as well as Bert Berns who worked with Van Morrison, The Strangeloves, The McCoys, and a bunch of others. If this is some kind of studio group, they're pretty damn good in my opinion, as both sides are terrific garage with great cheesy Farfisa organ dominating both. 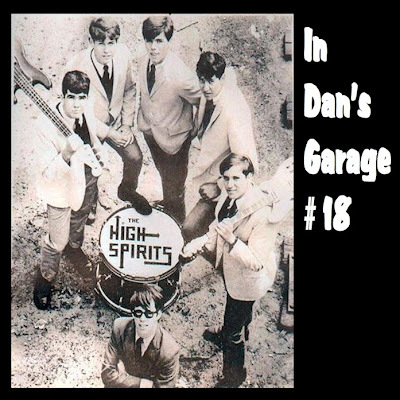 This mystery group does a fine job aping Mitch Ryder. Both sides of this are great Blue Eyed Soul tunes with a nice garage flavor to them. Awesome garage/punk burner from Tampa, FL. 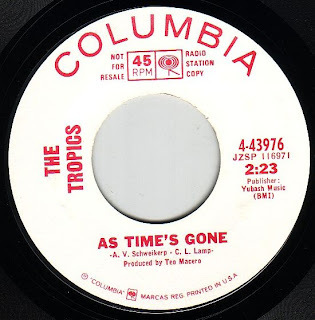 The Tropics had several 45s, two of which are on Columbia, and are their best. 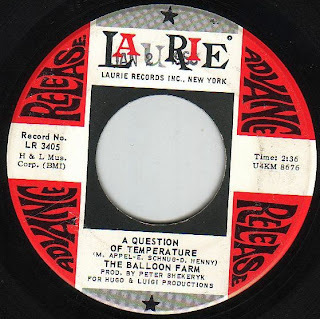 My question is, how the hell did Teo Macero, the guy who produced such rockers as Dave Brubeck, Thelonious Monk, and Miles Davis end up in the studio with these guys?????? One of Minnesota's best garage/punk acts. These guys were formerly known as The Electras, and had a bunch of 45s, all great. Both sides of this one are intense punkers, with the flip side being real menacing. 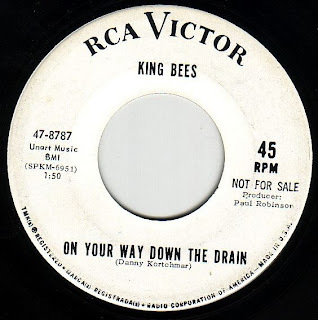 Not to be confused with the Canadian King Bees, this group was from New York City and some of their members went on to back up James Taylor. 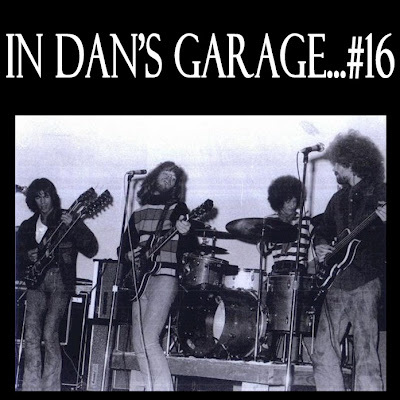 Hear their first one on In Dan's Garage #4. This group evolved from The 'D' Men, whose "So Little Time" is one of my favorites. 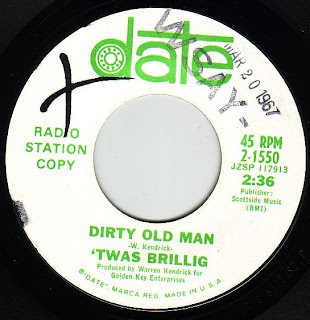 The Fifth Estate's claim to fame was a cover of "Ding Dong The Witch Is Dead". 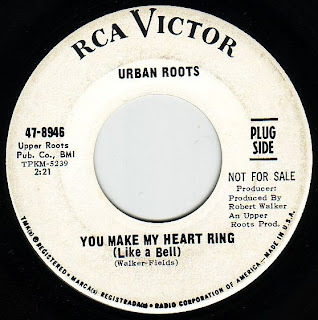 They had a penchant for doing whimsical pop type things, but this song really stands out with its ringing 12 string guitar and almost snotty vocals. 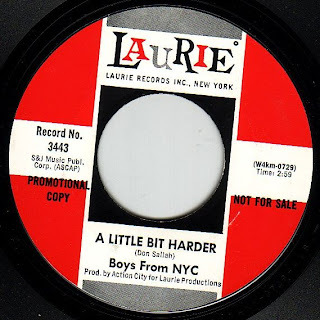 This group also released 45s as The Boys From New York City of which "I'm Down Girl" is one of my favorites. 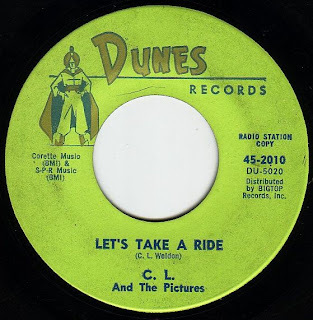 This one's a great psyche number backed with a nice folk rocker. 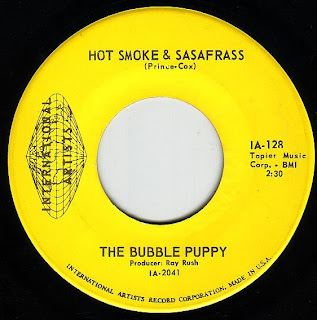 Everyone should know this classic psychedelic novelty which has made the rounds of many compilations. 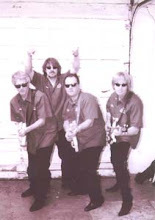 Obviously a studio group which probably included Dave Burgess who played with The Champs of "Tequila" fame. 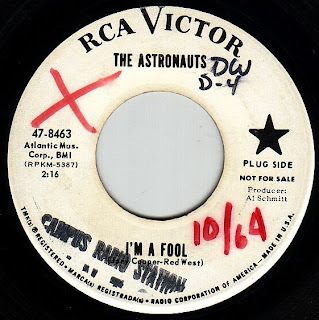 From Calgary, Alberta Canada, this group had the fantastic "You Do Things"/"Labourer" on RCA. 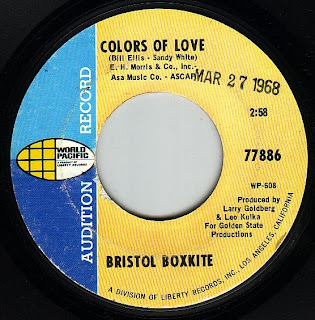 They later had a poppier psych sound as heard on this 45. Both sides of this are great, and Twilight Woman was actually a hit in Canada and parts of the US. Wow. I could probably fill a few pages on this band's story, but I'll be brief. 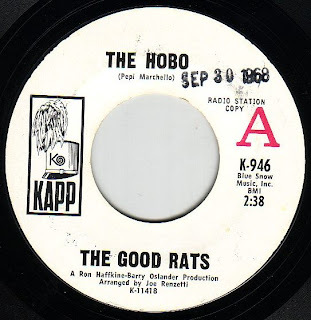 The Good Rats, also known as "The Worlds Most Famous Unknown Band", are from Long Island and are led by vocalist Pepi Marchello. 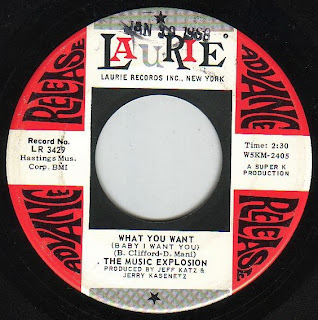 The debuted in 68 with this single and an album of great psych on Kapp records which really went nowhere. After a few years they changed their lineup, adopted a great hard rock sound and released "Tasty", an album which I wore the grooves out of when I was a teenager. 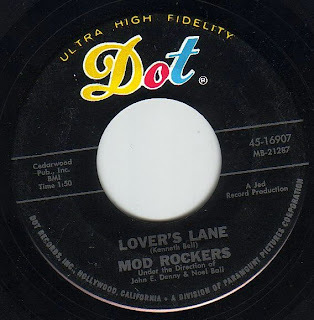 Never real superstars, they did in fact share the bill with some of the greatest rock acts, including The Rolling Stones, Kiss, and The Ramones. They still perform to this day and continue to make regular visits to Rochester. This Sacramento group evolved from Group 'B' and The Oxford Circle. Their album is very sought after. 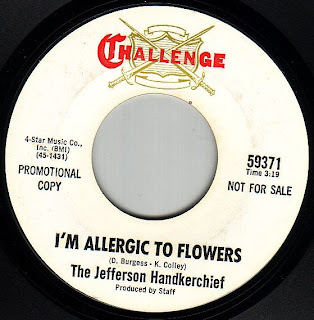 This nice little folksy/poppy number is by none other than Mickey Rooney Jr. Mickey had a nice musical career and appeared several times on Shindig!